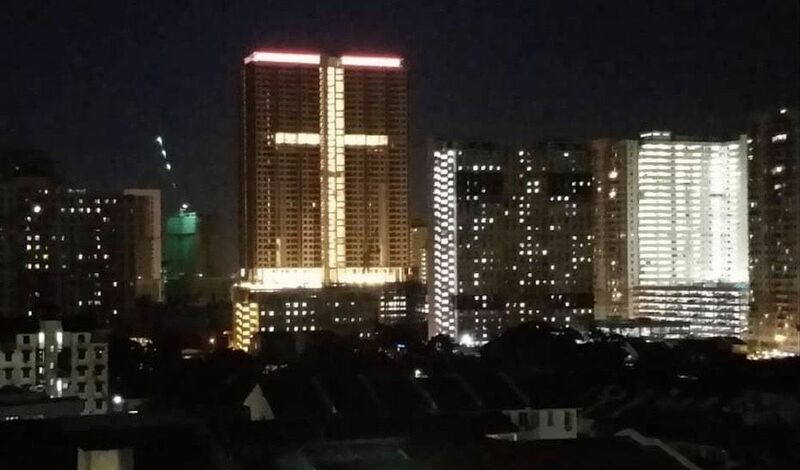 A cross – or what looked like one – caused a major stir in Malaysia this week and right after this incident, a report blamed Islamic extremism and communism for a sharp rise in global violence against Christians. In Malaysia, the Islamist opposition came at the forefront against a symbol displayed on a building that confused some Muslims in Pakatan Harapan held Penang. However, it is possibly a tweaked shot of the building with the symbol lighted at night that is the origin of the confusion after it went viral. Malaysia is still reeling from last year’s events when a Hindu temple, the Mariamman Temple, was attacked by a group armed with machetes and sticks. The attacks resulted in the death of a fireman and his death is now exploited by the Malaysian opposition as an act against Muslims. PAS – Party Islam Malaysia – information chief Nasrudin Hassan said one of the founders of the apartment – where the cross-like shape is displayed – was involved in a US-based Christian business group. “The founder and managing director of the project developer is a person who is actively involved in the Nehemiah Project and in promoting the Christianisation agenda,” he alleged. The owner of the apartment building is Nova Mulia Development Sdn Bhd. The PAS believes the display of the cross is part of a ‘Christianisation’ agenda by the owners of the apartment building. Netizens, albeit biased at times in their comments on the incident, showed their rage accusing the PAS of blindness or of fearmongering some supported the Islamists for fear the ‘Christian’ agenda was real in Penang. Penang has a history of controversies raised by Muslims in particular against the current DAP-led state government. The situation was no different under the Gerakan (Barisan Nasional)-led regime too. The state had its share of attacks against proselytising of Muslims and against the distribution of Bibles to Muslims at the workplace by non-Muslims. It is illegal to promote Christianity or any other faith to Muslims and this is not bound to change under the Pakatan Harapan government. But was it a cross that was displayed on the building in Penang? 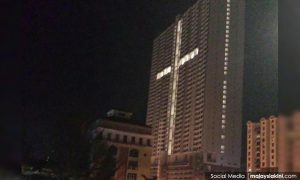 Reports have since then said cross in lights on the Grace Residence building in Jelutong, Penang, was actually a Chinese character for ‘royal’. De facto Islamic Affairs Minister Mujahid Yusof Rawa has called for a stop to sensationalising of the ‘cross’ issue. “I advise everyone to stop sensationalising the issue to the point that it can lead to other things and cause hate (among religions). “We have to be fair, and the developer should also be sensitive to such issues,” he was quoted as saying by Berita Harian. However, the fact the photograph – taken in an angle that showed a cross, instead of the full extent of it showing the Chinese character – went viral is signs of deeper unrest in some minds in the country. Perhaps the Pakatan government should go a notch higher in condemning those who stirred religious sentiments in the country? On a global scale, Africa is a major epicenter of violence against Christians, with groups loyal to the Islamic State growing in sub-Saharan Africa. Asia is also seen as a new hotbed in persecution against Christians with China leading in its anti-religious drive. But countries like Indonesia, Pakistan and India are not far behind according to reports. Open Doors, a group that published a report on violence against Christians, noted a splinter group of Boko Haram, the Islamic State West Africa Province, or ISWAP targeting Christians in Africa. Nevertheless, some reports said the ‘Cross’ in Malaysia has since then changed to the Chinese word ‘Ong’, meaning prosperity. The Penang Island City Council (MBPP) has been instructed to investigate claims related to the controversial apartment building in Jelutong. On its website, the Nehemiah Project International Ministries (NPIM), which is headquartered in the state of Oregon, USA, describes itself as a business development and support organisation through “biblical entrepreneurship” training, coaching and access to capital.